Mobile World Congress was one for the record books! For starters, we blew-out last year’s number of visitors to Canonical’s Ubuntu booth. The mixture was consumer targeting businesses looking for device/mobility updates, IoT advances, and innovation around artificial intelligence (AI) and augmented reality. On the other hand, enterprise back-offices, many of whom were communication service providers, exploring ways to reduce their data centre costs while improving efficiency. For each visitor, we demonstrated that Canonical is the right solution for bridging the innovation gap. In addition to being in the top 15 most mentioned brands on social media by Brandwatch, we are proud to be honoured by one of our major partners, Orange, for Outstanding achievement in converged computing & digital openness at their Device Partner Awards ceremony. With 25 awards over four categories, the Orange Device Partner Awards celebrates the 10th anniversary of the smartphone and aims to recognise individuals and organisations across the telecoms industry that have contributed to the smartphone revolution. One of the hottest technologies in the entire show happened to be demonstrating in our booth. The Software Defined Radio, by Lime Laboratories, is a low cost, open source (app-enabled) software defined radio (SDR) base station that can be programmed to support any type of wireless standard. In addition to the SDR, Canonical was showcasing many commercially viable advances in the Internet of Things (IoT), Robots, Artificial Intelligence, and Augmented Reality. Each of these solutions was developed on Ubuntu. 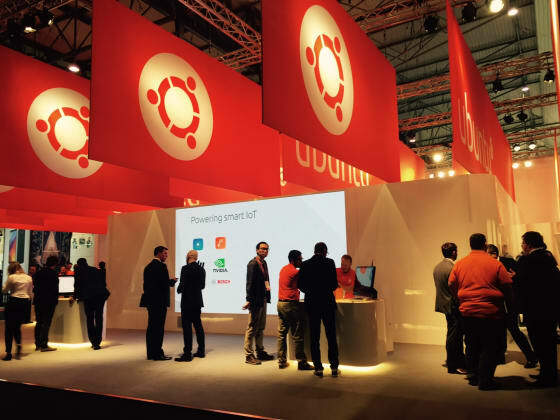 Further, the number of connected and autonomous vehicles was through the roof at MWC, and it’s worthy of note, nearly all self-driving cars made today have Ubuntu behind the wheel. Below is a short video that highlights some of the innovation on display in our booth. We are already planning for 2018 which will be bigger, better, and brighter.